In the spirit of Valentine’s Day, I think it makes sense for me to introduce you to my better half. 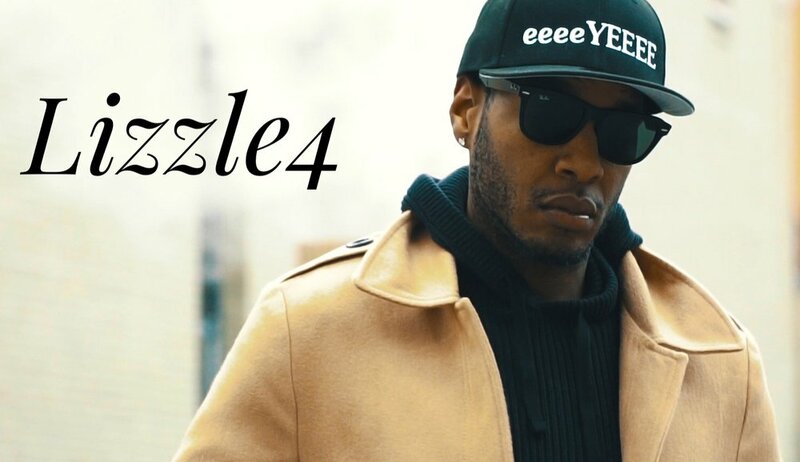 Check out the WORLD PREMIERE of his new music video, “Here to Stay” followed by an exclusive (AND DEEP) interview with, the one and only, Lizzle4. In medicine, we honor individualism and achievement — oftentimes leading us to forget that we can be BOTH our own person and we can exist in relation to others. Most of us who arrive in medical school are “type A” to some degree - I reluctantly harbor some of these tendencies. With our inclination towards achievement and perfection, we forget to carve out space for ourselves as humans — we build up an identity of strength and independence. We pride ourselves on working long hours and absorbing large amounts of knowledge in a short period of time. It can be difficult to admit when we are in over our heads. Something I am currently struggling with is allowing myself to accept help and love. Since I was young, I had dreams of becoming a doctor - I never took my eyes off of that goal (shout out to all my strong, independent people out there who hustle ‘til the wheels fall off, and then keep going!) My mama raised me to thrive without the love and help of anyone else - she has even told me that if I wanted to, I could raise a whole family without help (LOL!). I am only just now learning how to authentically let people into my circle and into my heart — to take the plunge and be vulnerable with another person. Love is essential to living a meaningful life and it comes in many forms. It is okay to love another person so much that life without them terrifies you. It is okay to rely on another person for support. We are social and communal beings - and love, in whatever form, is a beautiful thing. And with that, I introduce to you, in the format of a “Humans of Medicine” interview, Elon “Lizzle4” Fyfield, a man whose presence lights up an entire room. Elon, you are the love of my life. The idea of life without you terrifies me. I’m going to love you until the wheels fall off and then, I’ll keep loving you. Elon “Lizzle4” Fyfield, 27 ½ years old. Born and raised in Cambridge, MA to a mother from Kingston, Jamaica and a father from Port of Spain, Trinidad & Tobago. I attended college at Indiana University - Purdue University Fort Wayne where I earned my Bachelor’s and then my Master’s degree in Educational Leadership. I’ve always gone against the grain and I think that’s why I get a lot of side eye. I’m not your ordinary black guy. I was raised as the 4th child, or as my siblings would refer to me, “the prince” of an immigrant household. My mother being Jamaican and my father being Trinidadian were extremely strict with my 3 older siblings. By the time I showed up, almost a decade later, there was so much love and stability in my household. In conjunction with the black heroes and leaders that I had in my daily life, I was molded into viewing myself as a king — I believed I could achieve anything and everything. That’s why rather than playing Division 3 basketball like a lot of people around me wanted to, I decided to take a Division 1 volleyball scholarship instead. That’s why rather than enduring knee surgery and calling it quits after earning my Bachelor’s degree, I decided to medically redshirt and earned my Master’s Degree in Educational Leadership (virtually for free)! After graduating, rather than going overseas to continue to play volleyball like a lot of people wanted me to, I decided to return to my community and teach the next generation how to do what I had just done. Sorry for the long-winded response! I have so much to say and want to give the fans of The Human Side of Medicineeee a chance to really get to know me. I am currently the Director of Qualls Academy, an all boys program in the Cambridge Public Schools designed to help young men, with a deep focus on young men of color, to achieve and recognize their overall potential in their personal, social and academic lives. I am blessed with the opportunity to wake up and put in the type work where I feel I can help change the world. I balance my two professional careers, being an educator and a clean musical artist, allowing me to connect to my students in ways that most educators cannot. With so much TRASH music being produced by some of the world’s biggest artists, I feel like it’s my God given responsibility to stand up to what’s popular in the moment, and to give our people, especially our young scholars, the right messages — whether in the classroom or within the music — that will allow them to flourish in life. I’m motivated by the fact that I have the ability to change the cycle. I’m the wrench in the plans of the higher ups that can help improve black lives and families forever. I honestly can help impact all lives - I’ve seen my impact at work. It does not matter that I’m a 6’5’’ tall black guy, people of all races and ages identify with me because I give my all and keep my energy high. Seeing my power and impact at the school where I work only excites me for what’s to come when I decide to package myself up and seesaw over into a more musical direction. Sooooo are we already at the part of the interview where I am suppose to go completely goo-goo gaa-gaa over the creator of The Human Side of Medicine? Because regardless of what you want, you know I’m going to! Anyways, alongside my family, by far, without a single doubt in my mind, the most important person in my life is this beautiful, intelligent, kindhearted, thoughtful, amazing future doctor, who is also the host of this website and brand new podcast, Rose Schutzberg <3. 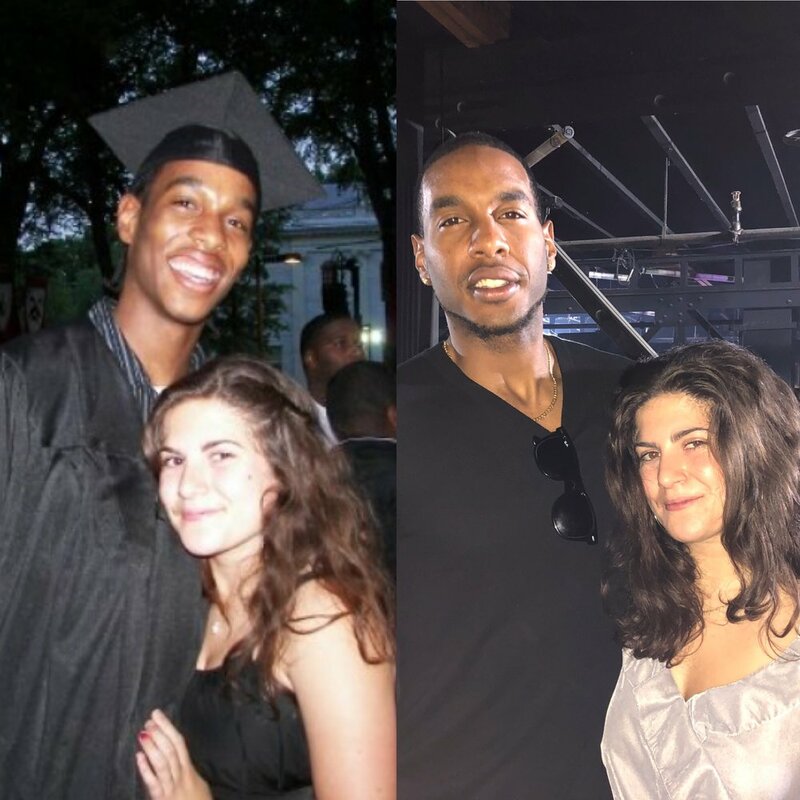 A real-life #tenyearchallenge: Elon + Rose at Elon’s 2009 high school graduation (left) Rose + Elon celebrating a friend’s birthday party in 2019. So I’m not thinking anything of it really because at the time I was already in a relationship for over a year with someone that I really cared about. But then this guy walked into practice the next day, smiling ear to ear with the most beautiful girl I literally had ever seen in my life. All I could think when she was walking over was, “Yo, she’s NICE!” She walked over made direct eye contact and introduced herself. I shook her hand at first and then I remember giving her a hug right away. She smelled amazing and felt perfect in my arms. In that moment, for the first and only time in my life, I knew that I had just experienced love at first site. The only good thing about that moment, was the moment itself, because the aftermath was God-awful! As I mentioned, I tend to do what I want rather than listen to other people. Most of the time for the good, but I have made my share of mistakes. I do not condone playing with peoples hearts, feelings or emotions, but even 10 years ago when she was just a high school freshman, I knew there was something extremely special and unique about Rose, and I selfishly went for what was going to make me most happy. Fortunately/unfortunately, later that year I earned a scholarship that took me 1,000 miles away. I told her many times after I left for school that we never broke up; we were just taking a break. She would laugh it off at the time but I always knew who had my heart. With a ton of ups and downs and life experiences, fast forward 10 years later from when I first met Rose and we are back, better than ever. Dating for a couple years, then being forced to take a break, really made us become friends, which is uncommon in a lot of relationships today. For years, we never saw each other, just chatty pattied on the phone until we would fall asleep. No matter whom we were with, we always said “I love you.” Even though I know she couldn’t really see all of this ever happening, I know us communicating the way we did and always ending with an “I love you” meant that I still had a part of her heart. That small glimmer of hope never faded and is what ultimately brought us back to one another. Now here on Valentine’s Day in 2019, we have been together for over a year and are really figuring out how to co-exist with and without one another. Rose being a med student weighs heavily on me, especially when these crazy 4 – 8 hour tests pop up out of nowhere! Her ability to put everything to the side to focus on her dream of becoming a doctor is inspiring, but also leaves me lonely at times. Even though the communication was always there between us, trying to sync ourselves to each other’s lifestyles was difficult. As we have worked through a couple of disagreements, I feel like we are finding the common ground and balance that we need to truly make it to where we want to be both individually and collectively. My perfect day would start with waking up whenever I decided to wake up. I’m not one of those wake up at noon type of people, but when I can sleep in past 8 o’clock, I feel like a million bucks! I want to wake up next to Rose everyday possible. She’s an angel, especially when she is sleeping. I find myself asking God, “HOW!? How can this future doctor, who can literally catch the interest of anyone, be so interested in me?” But then I turn around and make something great happen for Qualls Academy, or I write a new song in front of her and we switch roles and she will ask me “How! ?” The truth is, any day that I can spend with Rose, around my scholars, around my family, friends and music is a perfect day. I love helping others and seeing the people around me grow into their full selves. As long as I can continue to be a strong and real voice of reason for my community and fans all over the world, my days are perfect. God has truly blessed me with the life that I have the privilege of living on a daily basis. My dream is to become bigger than Drake. I know that may seem silly, but if I am ever able to get even 1% of the eyeballs that he has on him, I can start to turn the tide to help create a better tomorrow. Music is one of the only tools, regardless of race, gender, class or any other box you want to put people in, that can bring people together. When I play my music for my scholars, to see black children, white children, asian children, immigrant children all enjoying moments together, it becomes bigger than music. I know that my super power is making the music that the world needs to bring us back together during some of our toughest times. We are currently living in some of our toughest times. We also live in a divide-and-conquer type of world. As a people, we spend so much energy focused on others and what they are doing and not enough on our own dreams and goals. Being the educator who helps students develop their dreams and then practicing what I preach through the music that I create is the best job for a guy like me. I feel like a super hero on a daily basis. I would be lying if I told you that I wasn’t already living my dream. I just want the world to come along for the journey with me! Elon after graduating with his master’s degree. My proudest moment was earning my Masters Degree in Educational Leadership. The reason why this is my proudest moment isn’t what you think. It isn’t because I was able to drop a mix-tape called the College Graduate right after graduation. It isn’t because I knew that being educated and black would give me an advantage over a lot of the people around me. It was my proudest moment because I earned it for myself. Being 1,000 miles away from home, unfortunately my parents did not get to see me cross the stage. It was my proudest, and yet my saddest moment. While I watched all my friends take pictures with their families, and cry in their parents arms, and celebrate, I knew that I was walking back in my cap and gown to a dingy little apartment with my degree in hand. I remember people yelling and screaming for me as if they knew me personally and were so proud of me. An older lady even gave me a hug and told me she was proud of me. All of that made me proud, until I got back to my apartment where I had an emotional and mental breakdown. I threw my degree across the room and cried on the couch. Those tears represented everything. Being sad my family wasn’t there to celebrate with me. Being proud that after 6 years and 2 knee surgeries, that I earned my master’s degree. I cried at the thought of how strangers could see and feel the positive energy and vibes of a young black man walking in his cap and gown with his degree could be so encouraging, even more encouraging than people I knew. The day I earned my master’s degree, I felt myself transform from a boy to a man. I didn’t have mommy or daddy or any type of support system to celebrate the good times or to dwell on the bad. I was my own man and I had to create my own way. Since obtaining my degree in 2015, I haven’t stopped bettering myself for myself. I wish that I could be more fearless about chasing my dreams. At this point in my life, I know exactly what I want, how I want it and what I deserve. Too often, I sell myself short in order to make others comfortable. I work extremely hard and I wish that I didn’t hide how talented I truly am. I am not the best at anything, but I can do a little bit of everything and I do it well. Too many times I give other people the platform to be the star when they aren’t ready for the stage. I am the guy, I always have been the guy and I can’t run away from my calling from God to be the guy. I wish people knew how I really felt about the state of the world. I think the way we live is backwards. I wish people knew that I believe mass media is devilish, the way it is currently being utilized. If fast food is so bad for us, why does McDonald’s have the best looking commercials? If Donald Trump is so bad, why do we continue to give him the press? Why does every artist in the music industry rap about robbing, killing and drug dealing? And then we sit here and wonder why robbing, killing and drug dealing are so popular in the black communities. I wish that people would open their eyes and see how we are being lied to and manipulated by media — to the point that people don’t even chase their dreams anymore, they just live through the dreams and realities of celebrities. I wish people knew that I, alongside with Rose, will work our asses off to restore humanity. My parents own a nice two-family house. For over 20 years, my uncle or aunt has lived in the second unit, leaving me in my old, dusty bedroom in the attic. That was not cool with me and even though she acted like it was cool, I knew it wasn’t okay with Rose. A few months ago my aunt moved out and the apartment, after 20 years, finally became available. I now have my own two-bedroom apartment walking distance from work and I get to help my family with finances. This has helped my family win like never before. Anytime that I lose a loved one it’s a sad memory. I actually could run down the list of all of the people that I have lost in only 27 years, but it’s too many to count. I’ve lost friends to drug overdoses, violence, car accidents, and natural causes. It hurts me so bad when I lose people that I know. I try to remember the good times we have and use their passing as motivation in pushing forward with my life. Ya’ll still reading? Ya’ll ain’t tired of me yet? Haha! As I have mentioned, I am a professional musical artist. I currently sing and rap. I am working on producing as well as engineering music. I want to be a multifaceted artist. Check out my official website: WWW.LIZZLE4.COM and some of the songs I have released: www.soundcloud.com/lizzle4. I will be on all streaming platforms later on this year and will continue to work hard to deliver the best music possible. My biggest fear is dying and not achieving my dreams and goals. I have so much positive energy and life that I want to give to the world that the only thing I fear is not being able to give you all my all. Have you ever felt like giving up? Describe the moment. How did you convince yourself to continue? My first semester of grad school could have easily been my last. I had just graduated with my bachelor’s degree and within a week I was enrolled back into the Educational Leadership Master’s Program. I remember being the youngest person and the ONLY BLACK PERSON in my cohort. I didn’t feel like I belonged. I felt that all my white counterparts were better than me because they came to class dressed professionally and used certain terminology that I didn’t quite grasp right away do to my lack of experience. Every time that I was asked to speak, I would feel the room get more quiet than usual. The quiet intimidated me. It felt like they were waiting for the dumb black athlete to make a mistake. I never felt like I belonged. I overcame this feeling when I encountered a professor who held me to the same high standard to which I now hold my own scholars. I went in with the excuse of not feeling like I belonged, and ultimately she told me that I still had to get the work done if this was something that I wanted. In that moment, I knew that none of my classmates were going to matter in my future and all I needed to do was to get through it. It wasn’t easy by any means, but I never gave up on myself and ultimately I was able to earn my Masters Degree in Educational Leadership! I am in the exact right place at this very moment. Sitting here writing down my thoughts, reflecting on my life, thinking about things I haven’t thought about in years because I am someone who loves to just push forward. I can’t control the past, only the present in hopes of making the right decisions for a better future. Being a young black man with the confidence that I know exactly who I am going to marry one day. Being a young black man with his own car, apartment, great careers that I love, money and the respect of many people around the world, I can’t think of a time of me being in the right place any more than what I feel right now. I am the most active lazy person you will ever meet. I had a gym membership but decided to cancel it once I moved into my apartment. Rose and I turned my spare bedroom into a study and workout room. Rather than trying to figure out a time to go to the gym, I now work out all throughout the day. After being a Division 1 athlete for six years, I cannot kill my body like that anymore. I also play and run my own basketball league called Ballin’ in The Bridge, where I rounded up friends from over the last decade to play in a basketball league that I sponsored at my job. I also play volleyball and am now getting into football. I love to play video games, love to write music and I am learning how to love reading. I admire Lebron James. Aside from him not going to college, he has been nothing short of remarkable on and off the court. Lebron James is the definition of a real leader. Outside of basketball, he has done so much for his community and the world. Lebron James is a symbol for hope. He started a school in his own community and pours money into other communities to help others. I watched him become excellent at a sport and let that be the driving force of his life, ultimately opening up many doors for him. The way we look at Lebron for his basketball ability, one day, I want people to look at me in the same light for my music. I watched people for years undermine his greatness, and regardless of whether you love or you hate him, you have to respect what he stands for. The people that can’t respect him will also find reasons why they can’t respect me and that is ok. Just have to stand up strong and tall and continue to push forward. I’ve been doing this interview for over two hours now and I am DEAD TIRED! I have work in the morning and need to go to bed soon. I always have been and always will be in love with Rose! My music is dope and you need to check out my new music video “Here To Stay” that dropped today! Check out www.lizzle4.com to see all my music videos and SoundCloud to hear my music. Follow me Instagram @Lizzle_4! Thank you Elon, for sharing your story and more importantly for loving me through so much life. I love you with all of my heart x 1,000,000 and being your significant other is one of my life’s great privileges. Readers, who is/are your human(s)? What do you love about them? Let us know in the comments and don’t forget to check out @Lizzle4’s latest music video (above) for his song, Here to Stay. And remember, love always wins.